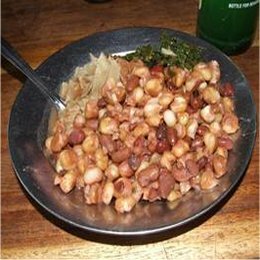 This is a general information page about Kenya food. Click here if you are looking for Kenya food recipes. I also added pages with appetizer recipes and dessert recipes. food recipe? Tell us about it! Although the large majority of Kenyans are Africans, people from other cultures - Arabs, Europeans, Indians and Pakistani - have led to quite some diversity in Kenyan cuisine. Traditional African food is supplemented by British, Arab and Indian fare. As these developments have gone on for centuries, it's hard to separate these influences from each other. But common dishes in Kenya include beef or chicken with potatoes, rice or vegetables. Fruits are also eaten a lot with the main meals: bananas, pineapples and papaya are available throughout the year, and citrus fruits seasonally. Most meals in the country are also centered on Ugali, thick dough-like mass made from maize or cassava floor. Coffee is a Kenyan speciality, as this is a main export product. Although ironically, many places only serve instant coffee. Tea (often called chai) is even a bigger export product and available in many sorts and flavours. The national beer is Tusker. Not only is this very good beer, but a Tusker t-shirt is a standard souvenir to take home. Bottled beer and soft drinks are often served at room temperature - which is warm! - so specifically ask for cold drinks if you prefer that. Kenya is not known for it's wines or liquors, but Lake Naivasha Colombard wines are generally quite good, AND some liqors are produced locally such as rum. Major cities such as Nairobi and Mombasa have some excellent restaurants, which meet Western standards in all areas. 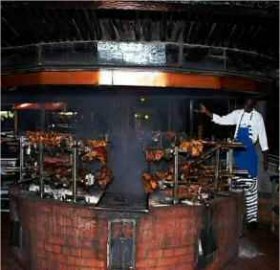 In Nairobi and Mombasa one can choose between African, Indian, British, French, Italian, Lebanese and many other restaurants. Most also serve vegetarian meals, but often the Indian restaurants offer the most choice in vegetarian food. Outside of the cities you may be limited to hotel or lodge meals, which can still be good. And of course you haven't really visited the country if you haven't eaten in places that are frequented only by Africans. If you only use some common sense regarding food safety (see below). The bigger cities have big supermarkets that meet Western standards. Many familiar Western brands can be bought there as well as Kenyan food brands. The prices are still lower, but not so much lower than in most Western countries. Most Kenyans cannot afford to buy anything there. They buy their necessities at small local shops, on street markets or directly from producers. In Kenya food and drinks should always be treated with some consideration. Tap water is never safe in Kenya. Always drink bottled water, which can be bought throughout the country in sizes between 0,20 and 5 liters. Be aware that there are fewer refridgerators in Kenya than in North America or Europe, and many people in Kenya don’t use the same standards of hygiene when handling food. Meat, fish, eggs, and to a lesser extent dairy products and anything that isn't cooked or baked is riskier than other cooked products (rice, potatoes, vegetables, etc.) This also goes for "fresh" fruit cocktails, et cetera. Better take soft drinks, bottled water, tea or coffee (especially when the water was really boiled). Tusker and White Cap beers (which are brewn in Kenya) are safe, and are available throughout the country. But drink local beers, called muratina, at your own risk. It's good to have some medication with you for stomach problems, etc. As stated above - this is not to say that you shouldn't eat at all in the cheaper restaurants, but always use some common sense.